Examination for the above three papers will be held on 1st, 2nd and 3rd June, 2016 respectively. The candidates will be provided a Question Paper Booklet and an OMR answer sheet for answering the questions. 2. The candidate must write his 6 digit Roll Number, as allotted to him/her and printed in the Admit Card, on OMR Answer Sheet in boxes and darken appropriate circles with Blue/Black Ball Point Pen. Similarly, write Question Paper Booklet Number as also the codes viz A or B or C or D, as the case may be, subject code and Exam Centre code on OMR Answer Sheet. The candidate should not write his/her name, Registration Number and also not to make noting/scribbling on the Answer Sheet and Question Paper Booklet except in the space provided for rough work. In case any candidate fills in the information wrongly, the Institute will not take any responsibility of rectifying the mistake. The Question Paper Booklet Code as darkened by the candidate will be final and the result will be processed on the basis of the circle darkened by him/her. 3. Candidates are required to correctly fill in the Question Paper Booklet Code (as mentioned on the top of the Question Paper Booklet) in the OMR Answer Sheet, as the same will be considered final for result computation. Candidates not filling the Question Paper Booklet Code will not be awarded any marks. 4. Each candidate will be given Question Paper Booklet printed in English except Industrial, Labour and General Laws, Paper of Module-II where the Question Paper Booklet printed in English with Hindi translation (bi-lingual) will be given to the students who have opted Hindi as medium for writing the CS examination. 5. Candidates should not open the seal of the Question Paper Booklet before the time specified for the commencement of the examination. 6. Every candidate is required to satisfy that the Question Paper Booklet given to him is of the medium opted by him/ her and contains the number of pages as printed on the cover page of the booklet. In case of any discrepancy, he/she should ask for replacement of the Question Paper Booklet immediately. 7. The OMR Answer Sheet contains the serial number of questions as given in the Question Paper Booklet. Against each question number, there are four circles marked as A, B, C, and D which correspond to the four answer options of which one is to be darkened on the OMR Answer Sheet only. No marking should be done on the Question Paper Booklet. 8. Candidates are required to sign in the OMR Answer Sheets and Attendance Register/Sheet in the same manner as they have signed in their application form and Admit Card. Before signing the Attendance Sheet, candidate should remove the “Barcode Sticker” of that particular paper from the Attendance Sheet and affix the same vertically in the space provided on the OMR Answer Sheet. 9. The Question Paper Booklet will consist of 100 Multiple Choice Questions (MCQ’s). Each question will be of one mark and for every question, four answer options designated as A, B, C and D are given in the Question Paper Booklet. 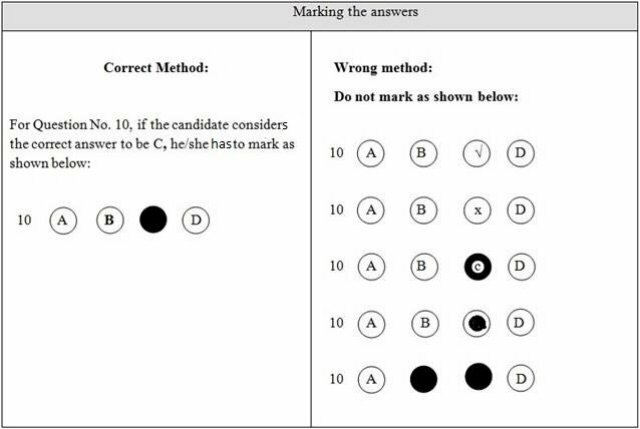 The candidate is required to select one amongst the options corresponding to the question as his/her right answer and darken the circle i.e. A or B or C or D as the case may be, to be the answer in the OMR Answer Sheet with blue/black ball point pen only. 10. For each correct answer one mark will be awarded. There will be negative marking for wrong answers. The negative marking will be applied in the ratio of 1: 4, i.e. deduction of one (1) mark for every four (4) wrong answers and total marks obtained by the candidates would be rounded up to next whole number. Further, the negative marks would be limited to the extent of marks secured for correct answers so that no candidate shall secure less than zero mark in the subject concerned. 11. Multiple darkened circles for a question will be treated as wrong answer. For question/s not answered i.e. blanks, no marks will be given or deducted. 12. Candidate has no option to change/alter/erase the answer once he/she has answered the question by darkening the circle. Therefore, before darkening the circle corresponding to the question number he/she is advised to ensure the correctness /authenticity of the answer. Use of white/correction fluid, eraser, blade, etc. is not allowed on the OMR Answer Sheet. 13. The candidate will be required to surrender the OMR Answer Sheet at the conclusion of each session of examination against acknowledgement by the Invigilator on the admit card. 14. Candidates may bring a card board or clip board on which nothing has been written so as to avoid any difficulty in darkening the circles in OMR Answer Sheet as the tables/furniture provided in the examination hall may or may not have even or smooth surface.